On the last day of the 2017 Aussie Millions, Crown Casino Melbourne was still buzzing with poker players. The chip riffling must have been heard from across the Yara river with cash games and multiple tournaments still running. The closing party that was called the AUD$5,000 Pot Limit Omaha attracted a field of 65 entries, with a lot of them being reentries from players that busted early and used their single reentry option to give it another go. After 14 hours of play, Espen Solaas from Norway came out as the victor, beating the likes of Dzmitry Urbanovich and title defender Daniel Demicki on the final table. Solaas walked away with AUD$100,815. The $5,000 Pot Limit Omaha event had a shot clock of just 20 seconds. Time breaker chips, like the high rollers had earlier this Aussie Millions, were nowhere to be seen. Every hand was quick, no one had time to ponder deep about decisions - 20 seconds and not a second more was what the player had to do with. Many of the regulars entered late with Bryn Kenney, Jeff Rossiter and Joni Jouhkimainen just some of the names entering as the closing of registration was getting nearer. All four them busted well before the seven-handed in the money table was even close to being formed. Phil Laak, who had sat down the moment the tournament had started, came closer but eventually had to surrender his chips with double suited kings to Dzmitry Urbanovich' single suited aces. There would be no real bubble excitement as two players departed in the same hand to go from nine to seven. Jarrad Godema and Gary Benson both lost to Raj Ramakrishnan. The latter was lucky enough to hit a nine on the river to crush both Godema's and Benson's hands who had been leading till that point. With the bubble out of the way, usually a lot of players bust in quick succession. That wasn't the case here as everyone had plenty of chips for some post-flop action. Still, play was relatively tight with many hands not even seeing a turn. Dzmitry Urbanovich picked up a lot of hands and won just about all of them. He soon build a stack worth 400,000 in chips, more than double that of even his closest competitor. The first in the money player to go was Daniel Demicki. The Polish player, who won this event last year for AUD$98,980, fell victim to Urbanovich. The latter made two pair with a double suited ace-queen-jack-five to crack Demicki's double suited kings. Six-handed play lasted for an hour before Thomas Levine hit the rail. He got it in with top two against the wrap of Raj Ramakrishnan and the latter hit on the river to send the Brit home. Allan Dabbajh eventually had to bow out in fifth place. He was the victim of a set over set situation where his set of sevens looked bleak against the set of nines of Espen Solaas. Not enough help on the turn and river and Dabbajh went on to collect AUD$24,440 for fifth place. Not much later, Jonathan Abdellatif would suffer the same fate. He got it in with a set against the over pair of Solaas, but the latter rivered a queen to make the bigger set and send his Belgian opponent to the rail. Dzmitry Urbanovich had been the chip leader for most of the final table but three-handed, his lead started to crumble. He lost more and more pots, especially to Raj Ramakrishnan who was playing Omaha for the first time but was hitting like no other. 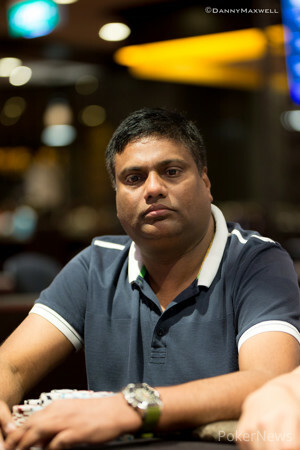 After multiple levels of play, Ramakrishnan had both of his opponents well covered and would soon eliminate the former chip leader Urbanovich. Ramakrishnan limp-reraised and then bet pot on a flop with two hearts. Urbanovich went with his flush draw and turned out to be up against a bare top pair. Urbanovich failed to hit on the turn or river and went to the cashier to collect his AUD$42,770 for third place prize. The chip lead changed hands multiple times in the several-hour-long heads-up but in the end it was Espen Solaas from Norway who walked away a winner. 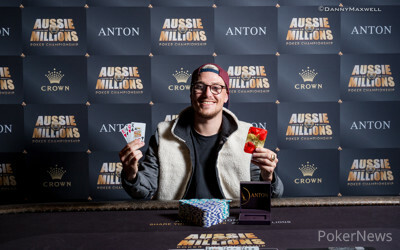 The two players got it in, both holding kings but thanks to hitting both his other two cards, Solaas was awarded the Aussie Millions ring and AUD$100,815 first-place prize. It took just one hand at the new level before all the chips went in when Raj Ramakrishnan and Espen Solaas became embroiled in a pre-flop raising war. At first, it looked like the pot could be an anti-climatic chop with both players holding kings, but fate had other ideas. Ramakrishnan was the at-risk player but both had the support of their respective rails, with the Australians calling for diamonds and the Norwegians calling for hearts. The flop came down a diamond-less to give both players a pair, leaving Solaas the only player who could hit a backdoor flush. The gave the Norwegian two pair, though when the hit the river Ramakrishnan thought he had it with nines and twos and looked crestfallen when Solaas pointed out he had the higher two pair. That was an epic heads-up battle, but in the end, Ramakrishnan had to settle for second place while an elated Espen Solaas was embraced by his watching rail. Espen Solaas raised the button to 36,000 and Raj Ramakrishnan called. The flop came and Ramakrishnan bet out for pot. Solaas shoved all in for a bit more and Ramakrishnan called. Solaas asked for a sweat, and got one: on the turn. The completed Ramakrishnan's straight and he doubled up. It looked like Ramakrishnan was managing to wear Solaas down and edge out in front before a car crash of a hand saw Solaas take a commanding lead. Ramakrishnan was the button and made the standard limp, Solaas popped it up to 36,000, Ramakrishnan re-potted to 108,000, Solaas potted again, Ramkrishnan re-potted and all the chips were in the middle. Solaas was the at risk player but was in front with aces and both players were on their feet in anticipation. "Hold! We want diamonds," the Norwegian player pleaded the dealer. While there were no diamonds on the flop, Solaas did spike top set. The river, however, gave Ramakrishnan some additional outs. "It's always good to have a sweat on the turn," said Solaas. While the river gave Ramakrishnan a set it was not enough and Solass went over to celebrate the double-up with his Norwegian rail. Espen Solaas limped in and Raj Ramakrishnan checked. Ramakrishnan check-called 12,000 on the flop and 30,000 on the turn, but check-folded to Solaas' 80,000 bet on the river. It was Solaas' turn to get aggressive and after Ramakrishnan made what had become the standard button limp the Norwegian popped it up to 36,000 in total. Ramakrishnan made the call and the flop fell . Solaas led out for a pot-sized 72,000 and after thinking for maybe 10 seconds Ramakrishnan called to take play to the turn. This brought another pot-sized second barrel from Solaas, this time for 216,000 to leave himself what looked to be about 23,000 behind. Ramakrishnan went into the tank and nearly ran down the shot clock before eventually folding. Espen Solaas limped in from the button and Raj Ramakrishnan checked. Ramakrishnan bet 24,000 on and another 72,000 on the 72,000 turn. Solaas called both times and checked behind on the river. Ramakrishnan showed and Solaas mucked. The first hand of the new level saw Ramakrishnan mix things up a little and increase the aggression, which is a change of pace from both players limping the button and folding out on flops. Solaas limped the button once again and this time Ramakrishnan re-raised pot. Solaas called and the flop came . First to act Ramakrishnan led out for a full pot bet of 72,000 and while Solaas looked like he was thinking about it he eventually let it go. I’m off to the big wicket of the #AussieMillions - but will never vote for Abbott and the current government. 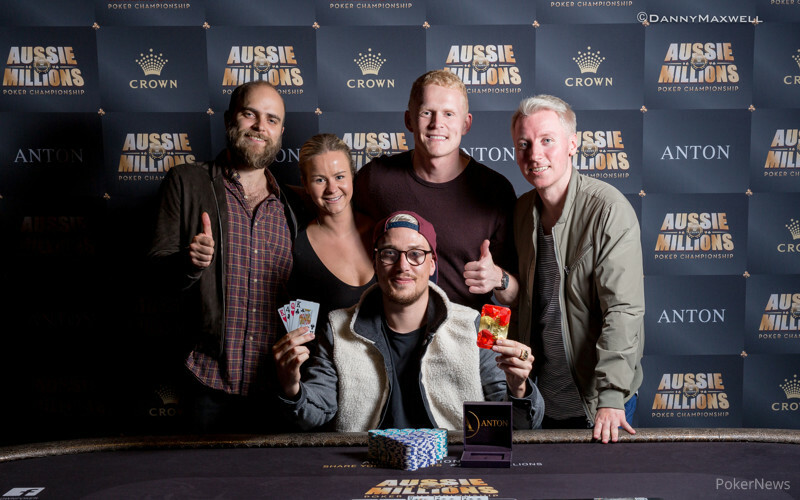 We're proud of the #AussieMillions - but a bets a bet then @cutmaker and yes no gimmies! Just got home & about to start my #aussiemillions campaign with my children/family.